Price is per 16-inch strand of these beautiful beads. Each measures a different size and shape, but largest is around 17mm x 12mm x 10mm - about 25 nuggets to the strand. Note: as these are natural, some with have tiny black inclusions within. ”Citrine” comes from the French word for lemon, and is any quartz crystal that’s yellow to orange. The darker, orange colors were traditionally the best, but today people prefer bright lemony shades. 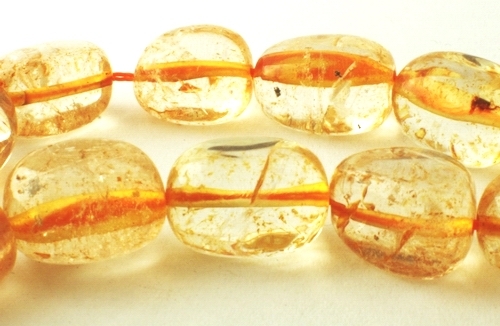 Citrine with manmade color tends to have more of an orange or reddish caste. Most natural citrine starts life as amethyst until heated in a molten state to change. Many people use citrine to attract wealth. In the Chinese science of feng shui, it’s thought that placing citrine in the Wealth Area of a room, the south-east corner, helps to bring money. I have one customer who says since she did this, her financial problems have disappeared! Sunny and affordable, citrine brightens all jewelry, blending especially well with the yellow gleam of polished gold. The yellow color is a natural reviver, and citrine focuses the mind bringing a feeling of self-esteem. In medication it helps re-establish the link between your conscious and subconscious minds. If you’re feeling down, try holding citrine to lift your spirit. It’s also very good at healing the body and helping people communicate. Citrine has warm energy, promotes optimism, and attracts abundance. Citrine is one of the few stones that removes negative energy and never requires cleansing. In ancient times it was carried as a protection against snake venom and evil thoughts. Known as a "merchants' stone”, placed in the cash register to not only acquire wealth but to conserve it too. Citrine is the birthstone for November, and its corresponding signs are Gemini, Aries, Libra, and Leo.